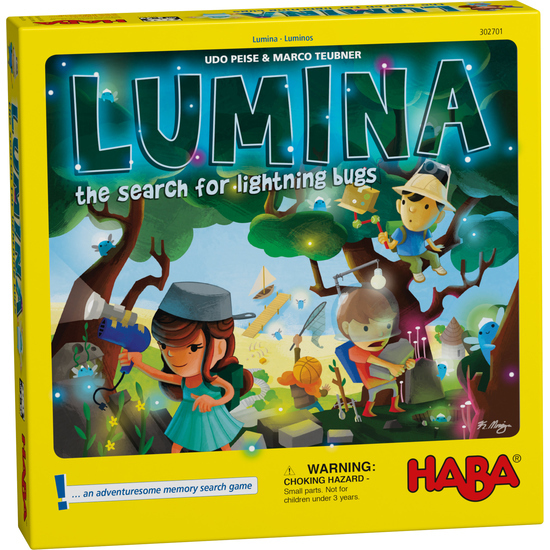 Enchanting lightning bugs flutter through the deep forest and across the broad fields on the island of Lumina. But it is not easy to find them because the lightning bugs sometimes hide out in old shipwrecks offshore and sometimes in the enchanted ruins on the island, and the distances between the locations are long. Who can best remember how to get from one location to the next and be the first to find five lightning bugs? Contents: 1 game board, 4 adventurer pieces, 15 location cards, 16 lightning bugtiles, 1 set of game instructions.